Chaste tree, also known as Texas lilac, makes a perfect blooming specimen shrub or small tree in low-maintenance landscapes. Vitex is originally native to China, but has naturalized in the United States since about the 1600’s. Vitex has a spreading habit with a very organic shape so be sure to provide it plenty of room. Plants have palmate leaves that have a silvery hue. Plants are deciduous and leave out mid-spring; plants begin to bloom in late-spring to early-summer and will continue through early fall. The fragrant flowers form on large spikes that are 8-12” in length and attract many butterflies and bees. Vitex is typically most commonly available in blue-flowering varieties, but can also be found in pink and white. 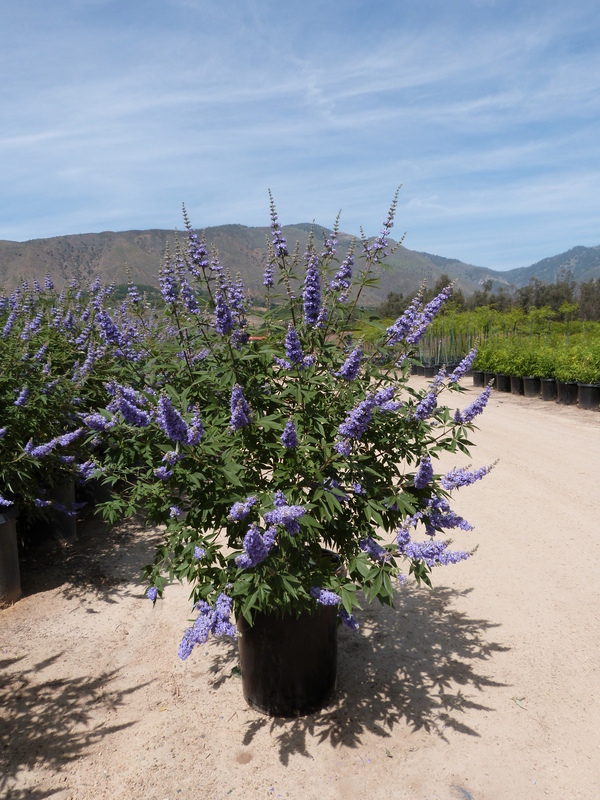 VItex performs best in a full sun location and adapts to a wide array of soil types. Vitex is very drought tolerant once established. Plants are very easy to grow given their low susceptibility to diseases or pests in the landscape. Handling the tree too much and cause mild irritation to the skin, so gloves are recommended. Note that plants can reseed freely under the right conditions.